Some powerful tales in history involve angels intervening in human events. 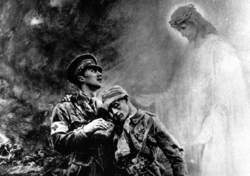 Such is the case with the Angel of Mons story in which spirits from heaven helped save British soldiers during World War I.Fortean Picture Library. In September 1915, noted British writer Arthur Machen published an article in the London Evening News about the World War I Battle of Mons, which had occurred in August of the previous year. The battle was the first significant engagement of the war between the British and Germans, and it resulted in a British retreat from the field. In his article, actually a reprint of a story that had appeared in a book of his short stories published in the spring, Machen focused on the account of a British officer who reported that as the army moved west, he had seen shimmering lights in the sky from which emerged winged figures carrying bows and arrows. Thanks to the distraction provided by these figures, the British were able to make a successful disengagement from the Germans. He noted that two others had also seen and made note of the mysterious angelic forces. Machen later received letters verifying the event. The believability of the story was increased due to the semi-miraculous nature of the retreat against large odds of success. In fact, the story is complete fiction, the events first recounted by Machen being a figment of his imagination that inadvertently played to the deeper hopes of his readers at a time of crisis. There is no verifiable evidence that any phenomena occurred during the retreat from Mons to have suggested the story. Begbie, Harold. On the Side of the Angels. London: Imperial War Museum, 1915. Machen, Arthur. The Angel of Mons: The Bowmen and Other Legends. New York: G. P. Putnam’s Sons, 1915. Stein, Gordon. The Encyclopedia of Hoaxes. Detroit: Gale Research, 1993. Taylor, A. J. P. The First World War: An Illustrated History. London: Penguin, 1963. MR ARTHUR Machen, above, the novelist who originated the legend of The Angel of Mons, died today at a Beaconsfield nursing home at the age of 84. DOROTHY Wedlake in her recent letter asked whether there was evidence like the account of the unauthorised truce on the front in 1914 of the account of the Angel of Mons apparition, which it was alleged so encouraged the British forces and terrified the Germans. But in the meantime the short but in the meantime the short battle had provided the first legend of the war - the Angel of Mons. On August 21 at 6pm, a free |lecture, e Angel of Mons and other Myths of the First World War, will be given at the Lit & Phil by cultural historian Gail-Nina Anderson. From time to time the Angel Of Mons - sighted by soldiers as they went over the top to their deaths - hovered dramatically above the battlefield. The testimonies of those who believed themselves to have seen the Angel of Mons - that configuration of awesome power which appeared over the battlefields - are witness again to the human need for spiritual help in unbearable situations and for their tendency to create the right kind of angel to fit the needs of the moment. David Clarke's The Angel of Mons (Wiley, 2007) is a good modern examination of the legend. During the First World War, soldiers reported many strange sightings, the most famous being the Angel of Mons which would mysteriously intervene to save them. In Wales, it was as damn near miraculous as the Angel of Mons,' he said. The letter from The Rev Willians with regard to the power of prayer during World War II reminded me of a story my mother used to tell me about the Angel of Mons.